Background Navigable, large diameter aspiration catheters demonstrate markedly improved recanalization rates over smaller lumen devices in suction embolectomy. We evaluated the performance of a novel aspiration catheter system designed to maximize lumen size, and compare it to other commercially available aspiration catheters. Methods The 6F R4Q aspiration catheter system comprises a proximal pusher wire of 117 cm length connected to a distal catheter of 25 cm length. When placed through standard guide catheters and into the cerebral circulation, the proximal catheter makes a tight seal between its outer surface and the guide catheter’s inner surface. 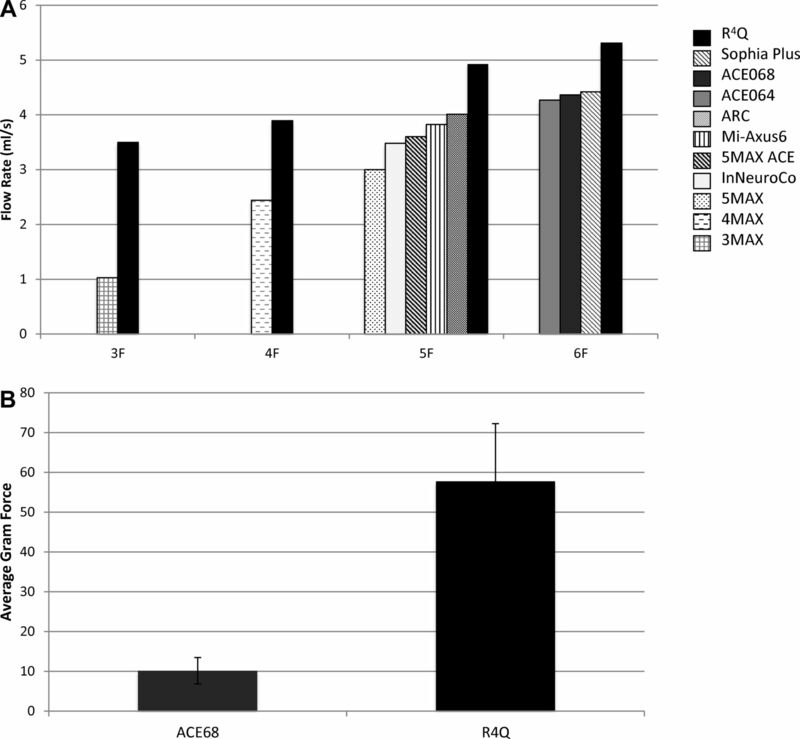 During aspiration, in vitro flow rates and tip suction force under gentle retraction were compared among 10 commercially available aspiration catheters and the R4Q system. Results The R4Q 6F, 5F, 4F, and 3F catheters achieved flow rates at least 21.9%, 24.7%, 61.9%, and 244.7% greater than the other catheters tested respectively and the R4Q 6F produced a 140.2% higher tip force than a catheter of similar size. Fluid flow rate in the R4Q 6F increased on retraction into the guide catheter, delivering a 58.2% increase from fully extended to fully retracted. Conclusion The R4Q design demonstrates a substantial increase in aspirated flow rate and suction force due to an increased effective diameter than standard tubular catheter designs tested. The prominent increase in the aspiration parameters measured in vitro supports the potential for improved clinical results during stroke thrombectomy procedures. Based on current data, it is possible that larger suction aspiration catheters are correlated with improved recanalization.11 14 17 Catheters with tapered, large bore designs have been introduced to harness the benefits of an increased tip surface area. Alternatively, a new catheter design effectively increases inner diameter for the entire system. We sought to evaluate these new suction catheters, all compatible with standard guiding catheters, that would retain, or even improve on, the navigability of current suction catheters yet profoundly increase the suction efficiency based on larger inner diameters. Due to neurovascular vessel size constraints, the design of an effective aspiration catheter often involves a tradeoff between suction strength and ability to access the distal neurovasculature. While improved suction power has been associated with larger diameter catheters,18–22 thrombi are often located in highly tortuous, small diameter vessels. As a compromise, the implementation of a tapered design is common. The distal tip of the aspiration catheter is smaller than the proximal shaft, maximizing both suction capability and distal access. This design approach is ultimately limited by the inner diameter (ID) of the required guide catheter and the minimum wall thickness of the aspiration catheter. The R4Q aspiration catheter (MIVI Neuroscience, Inc., Eden Prairie, MN) design overcomes these limitations by eliminating the proximal three-quarters of the catheter shaft and replacing it with a 117 cm, 0.018 inch stainless steel control wire. This enables the utilization of the full internal area of the guide catheter for the delivery of suction power (figure 1). A R4Q family has an outer diameter (OD) along the proximal catheter segments of 0.088 inch, with distal ODs of 0.082 inch, 0.072 inch, 0.055 inch, and 0.048 inch and named as R4Q 6F, 5F, 4F, and 3F, respectively. Similar to standard aspiration catheter designs, the R4Q is delivered to the clot site via a micro-wire and micro-catheter within an 8F guide catheter/6F sheath. Unlike standard designs, suction is applied directly to the guide catheter and the total system length is variable as the R4Q is extended outward and retracted into the guide catheter. Conceptual schematic of the R4Q friction fit into distal end of the guide catheter compared with the standard aspiration catheter system. The control wire (solid black) occupies less volume than the standard catheter within the guide catheter. Note: dimensions are not to scale. where Q=volumetric flow rate, π= constant pi, r=inner radius, ΔP= pressure drop, η=liquid viscosity, and L=length of tube. Improvement of thrombus aspiration requires increased flow-derived vacuum to achieve greater suction transmission through the catheter. According to the HPL, the variable leveraging the greatest effect on flow-derived vacuum is the mean ID of the device. Since even a small increase in ID results in significant increases in flow rate, the R4Q was designed to achieve aspiration rates and forces greater than standard catheter designs. Prior scientific examination has similarly established the powerful relationship of ID to pressure loss and flow rate in small vessels.18 24 25 We sought to compare these factors in the R4Q and other catheters in vitro. To empirically examine the performance of this novel design, we tested all sizes of the R4Q against 10 commercially available catheters (table 1). A representative effective ID was calculated for each catheter using the corresponding proportion of the distal and proximal IDs to account for the non-uniform IDs. The R4Qs’ distal IDs refer to the distal portion of the system, while the proximal IDs correspond to the guiding catheter used in the system. Other tapered catheters’ effective IDs were approximated with a 10% distal ID, 90% proximal ID proportion of the working length. The effective IDs are listed in table 1 for reference. Following a method previously described by Hu and Stiefel (figure 2A),26 a Gomco aspiration pump Model 4005 P (Allied Healthcare Products, St. Louis, MO) was set to deliver 600 mmHg of vacuum through 2.794 mm (0.110 inch) ID aspiration tubing (MIVI Neuroscience, Inc.) with a standard in-line valve and lure fittings. The R4Q was used in combination with a Super 90 guide catheter 8F (MIVI Neuroscience, Inc.), which has an ID of 0.090 inch, OD of 0.114 inch, and length of 90 cm. When the vacuum pressure attained a steady state, the valve was released allowing room-temperature water to be aspirated by the catheter into the pump collection canister. An electronic switch shut off the pump after 110 s, and the aspirated fluid was weighed. Standard values for water density were used to calculate the mean volumetric flow rate through the catheter by dividing aspirated fluid weight by time. This process was repeated three times and averaged for each catheter tested. The SD for each sample population never exceeded 1% of the measured average. Schematic of experimental setup for vacuum flow rate (A) and tip force measurements (B). Since the R4Q catheter is not one continuous tube throughout its length, this introduces the possibility of liquid entering the system at the junction between the R4Q shaft and the guide catheter. To observe this phenomenon, the catheter tip was obstructed with a ga pin and the flow rate was measured with the R4Q and guide catheter junction submerged in open water. This flow rate, 4.9 mL/min, calculates to 1.52% of the aspirated volume when the catheter tip is fully patent. Therefore, to account for a worst-case scenario in which all vacuum pressure is focused on the junction, we decreased the R4Q flow rates by 1.52%. In addition to dynamic flow rate, the force at the catheter tip was measured by simulating a corked tip condition. The setup is depicted in figure 2B. A 0.068 inch pin ga was inserted in the distal tip to create a nearly obstructed flow path after the system was flooded with room temperature tap water. The pin gauge was attached via a hemostasis valve to a digital force gauge (Ametek Chatillon, Berwyn, PA, USA) and aligned with the aspiration catheter tip. The junction between the R4Q and guide catheter was submerged in a fluid-filled closed tube to control the pressure and isolate the force measurement at the tip. Aspiration was applied to the guide catheter using the setup previously described and adjusted to 600 mmHg of vacuum. The force gauge and pin gage were pulled from the tip and the maximum gram force was recorded. The R4Q was used with a Super 90 guide catheter 8F and compared head-to-head with a Penumbra ACE 68 in the identical setup with aspiration directly connected to the ACE 68. For both catheters, the forces were also measured in the same configuration without aspiration to determine the force due to friction between the pin gage and the catheter tip. These forces were averaged and subtracted from measurements with aspiration to find the force attributed to aspiration in the catheter. As the nozzle tip of the R4Q system is withdrawn into the guide catheter, the overall length of the fluid path decreases. The effects of these factors positively contribute to flow rate (Q) in the HPL. In order to quantify this phenomenon, flow rate was measured as the R4Q was retracted within an 8F guide catheter. The flow rate was measured at full extension from the guide catheter. The R4Q was then retracted in 5 cm increments until it was fully inside the guide catheter. Flow rates were measured in five repetitions at each retraction point. The same procedure was performed with a similarly sized standard catheter. In the flow rate experimental setup, only three repetitions were necessary for each catheter tested due to low variability. All tests were performed with consistent experimental conditions in an attempt to limit confounding variables. An additional sequence of 10 flow tests was completed on the R4Q 6F and ACE 68 to confirm the validity of the results. Table 2 and figure 3A summarize the flow rate collected by this method. The R4Q exhibited higher flow rates than other commercially available catheters tested. (A) Catheter flow rates by outer diameter size. (B) Average gram force measured for the ACE 68 and the R4Q. Figure 3B portrays average force for each catheter, corrected for friction. Forces attributed to friction as measured with no aspiration for the R4Q and ACE 68 were 19.9 and 17.4 gram force respectively. The R4Q forces were more variable between trials but had a significantly higher average compared with the ACE 68 (Student T-Test, P<0.0001). The R4Q system benefits from its dynamic length. The R4Q exhibits significantly greater suction force at the tip than the other devices tested despite a similar distal ID and surface area. Furthermore, once the R4Q is retracted completely into the guide catheter, the cross-sectional area presented to the clot is significantly increased, leading to even greater suction. When the R4Q 6F is extended 25 cm out of the guide catheter, it exhibited a 39% increase in flow rate over the standard catheter (figure 4). At full retraction, the flow rate of the R4Q 6F was 117.2% greater. Since the length of a standard catheter remains constant during aspiration use, the flow rate does not change. R4Q 6F flow rate (solid line) at multiple positions inside an 8F guide catheter compared with the constant flow rate of a similarly sized uniform catheter (dashed line). An additional sequence of 10 flow tests per catheter was completed to confirm the validity of the results. This replication portrays the precision of the entire experimental design. A two-sample T-test conducted with JMP Pro 13 software presented a significant difference between the flow rates of the R4Q 6F and a uniformly sized catheter, the ACE 68 (n=10 for each device, P<0.0001). The SD for the R4Q 6F and the ACE 68 were 0.0544 mL/s and 0.0751 mL/s respectively, accounting for 0.98% and 1.59% of the average flow rate values. In the current study we demonstrated profound increases in flow rate and tip force in the R4Q catheter compared with standard suction catheters. These increases were correlated with the effective diameter of the R4Q, which harnesses the large ID of the guide catheter to improve suction. In effect, the R4Q achieves markedly improved performance without the need for larger ID catheters. Notably, percent increases in flow rate were greatest in the smallest diameter system comparisons, offering the promise of improved suction embolectomy in narrow, distal branches. Finally, we demonstrated that suction forces increase when the tip of the R4Q is retracted through the guide, which will likely diminish the risk of distal emboli migration caused by lack of adherence to the catheter tip. Taken together, these findings illuminate the differences between the R4Q’s alternative design and classic suction catheters. Unlike standard catheters, the R4Q system optimizes the guide catheter ID at the proximal end of the system. In addition, the ability of the R4Q system to shorten during use further improves aspiration rate and force. These properties have the potential to translate into clinical advances in aspiration thrombectomy. This study is limited by the mathematical assumptions of the HPL, namely that flow of Newtonian fluid is laminar and nonaccelerating through a circular tube significantly longer than its diameter. It is important to note that the HPL is ideal for a tube of constant circular cross-section. Although some of the catheters in this study do not have constant IDs, the HPL is used as an approximation for the physical relationships observed. The highly tortuous nature of neurovascular anatomy undoubtedly affects fluid flow dynamics and should be investigated further. It is also important to note that fluidic properties of water are similar but not identical to human blood. Blood is more viscous than water and is classified as a non-Newtonian fluid. However, we found that while flow results for one catheter differ between water and glycerol, the comparative relationship across catheters does not vary significantly. Nonetheless, these in vitro results are approximations and should be supplemented with clinical assessment. In addition, the tip force measured here does not represent a fully sealed catheter tip but rather it mimics a more realistic corking scenario in which the clot does not completely seal the tip interface. Previous work has revealed that catheters of varying diameters relay similar vacuum pressures but the theoretical amount of suction force relies on the area via F=P*A where P is vacuum pressure and A is catheter area.27 While this relationship applies to closed, static catheter systems, if there is any fluid or air moving through the system, more complicated physics apply. If the clot does fully obstruct the catheter tip from fluid and air, the clot itself shares properties of a highly viscous liquid and obeys dynamic fluid laws. Additionally, the measured flow rate increases as the system length decreased by retracting the R4Q into the guide catheter. This cannot be explained by the pressure-derived force since the area remains constant as the R4Q is retracted. Therefore, we hypothesize that the force at the tip is also dictated by the HPL. By leveraging established theory in fluid mechanics, the R4Q aspiration can deliver superior suction to many areas of the neurovasculature, even distal regions of the MCA. With this device, the complexity and time required for a successful mechanical thrombectomy are expected to decrease significantly, resulting in more effective procedures and improved patient outcome. Future work will assess the performance of the catheter in a clinical study.
. Rapid volume replacement for hypovolemic shock: a comparison of techniques and equipment. J Trauma 1984;24:428–31.
. Some observations on the anatomy of the middle cerebral artery. Can J Surg 1964;7:134–9.
. Flow Division. Hydraulic power system analysis. New York: CRC Press, 2006:299–333.
. 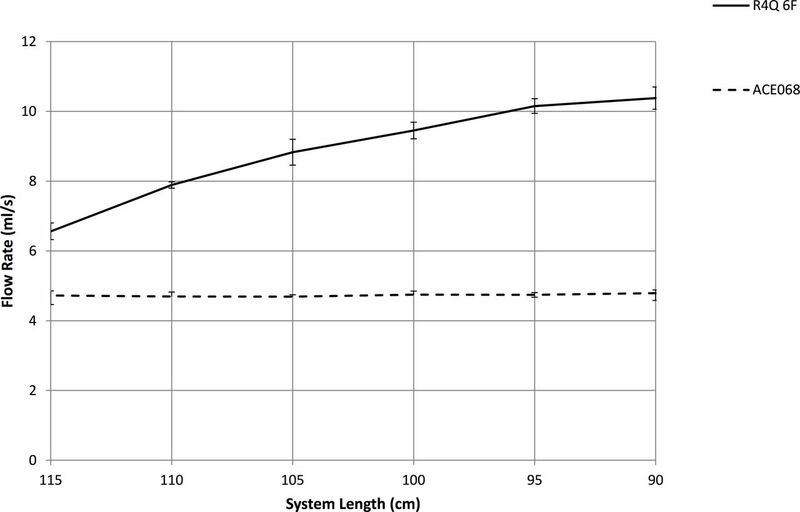 Comparison of flow rates for standard and large-bore blood tubing. West J Med 1985;143:183–5.
. A Simplified Method for Analyzing Circuits by Analogy. Machine design: Delmar Publishers, 1969:173–7. Contributors TDL, TS, AB, AMH, and DFK conceived of the presented idea and study design. AMH and JW collected and analyzed the data and drafted the manuscript. All authors reviewed the manuscript and delivered substantial feedback. Throughout the entire process, all authors provided critical input for planning, implementing, and presenting the study. Competing interests DFK reports other from Marblehead Medical, grants from CURAM, outside the submitted work; In addition, DFK has a patent Balloon Guiding System pending. RH reports personal fees from MIVI Neuroscience, Inc., outside the submitted work. AMH reports grants from MIVI Neuroscience Inc., during the conduct of the study; In addition, AMH has a patent 14/949,574 pending to Mivi Neuroscience Inc. JW reports personal fees from MIVI Neuroscience, Inc., outside the submitted work. AB reports grants and personal fees from MICROVENTION, personal fees from MIVI NEUROSCIENCE, personal fees from SCIENTIA VASCULAR, personal fees from ENDOSTREAM MEDICAL, personal fees from BENDIT TECHNOLOGIES, personal fees from MAGNETO THROMBECTOMY SOLUTIONS, and personal fees from ANGIODYNAMICS, outside the submitted work.